The Arab Revolt of 1916 to 1918 could not be said to have had a major impact on the Great War, and so in one sense it was a minor sideshow with little influence on the final result. What it achieved was to effectively entrap and isolate thousands of Ottoman troops in Arabia, meaning they could not participate in the defence of the Empire against the British invasion which ultimately would see the taking of Jerusalem and Damascus, and the Empire’s surrender. In another sense however its impact was huge. It was the manifestation of an Arab nationalism which had been suppressed by the Ottomans for centuries, and awakened a desire by the Arabs to rule themselves. Britain and France ignored that aspiration, and created a new Middle East with consequences we are all still very much living with today. On a lighter note, it also provided colourful and even exotic stories of daring exploits in a war that was dominated by grim, attritional warfare. In the West that story is closely associated with the title character of this set, Lawrence of Arabia, and this Strelets set is the very first to depict this fascinating campaign in 1/72 plastic. When Sharif Hussayn declared a revolt against the Ottomans in June 1916 he had little in the way of organised military forces with which to face the Ottoman Army, but over time he received increasing amounts of help from the British and French, gradually building an Arab or Sharifian Army from volunteers and Ottoman prisoners of war willing to change sides. 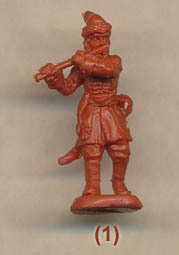 While this army grew and would eventually perform like any regular army, the irregular Arab cavalry of the Hejaz region and beyond were always an important element, and are particularly associated with Lawrence, so it is they that are modelled in this set, although they were only one part of the Arab Revolt. While there were numerous small differences in costume which were important in denoting wealth, status and tribe, for the purposes of a set like this it is sufficient to say that the irregular cavalry simply fought in their normal clothes, which were of course the most suitable for the conditions. The basic Arab garment was the thobe, a long tunic covering most of the body, and over this four of the poses here seem to wear a zebun or abaya, being a sort of cloak and generally worn for warmth or on formal occasions. On the head of course all wear the characteristic Arab keffiya or shemagh, the headcloth so well suited to the desert, and kept in place by the agal. Many here wear bandoliers or parts of webbing or leather straps, and naturally all have a traditional knife. Everything here about the costume looks correct and is appropriate for such men. Our last-pictured figure wears the keffiya, but otherwise wears khaki uniform as might be found in the regular Ottoman or British armies. This suggests he is a regular officer of the Sharifian Army in charge of the irregular horsemen, and with his binoculars and pistol he makes a good general regular officer too, or even a European one. All Arabs had knives, and most would have swords too, as we see on all the poses here. At the start of the Revolt many had the very old-fashioned jezail firearms, plus an assortment of other rifles obtained from various sources. As the British aid increased, many men were rearmed with the standard British SMLE rifle, though the variety was never eliminated completely. Most of the figures in this set look to have modern rifles, though the detail is much too poor to be precise as to what model they might be. A couple still hold the old jezail, which is a good thing, though both are of an unusual shape here. One man holds aloft a revolver, looking something like a Colt 45, and another has an absolutely massive model of what looks like a Mauser C96. This was a German weapon, but could have fallen into this man’s hands from a German or Ottoman enemy. However if it is supposed to be the C96 then it is getting on for twice the size it should be, and is bigger than the man’s head! The horses are a very mixed bunch in terms of pose, with some looking fairly reasonable and some looking absurd (first two pictured horses - this means you!). The harnesses and general horse furniture are quite highly decorated with tassels, fringes and other extras which looks authentic. One real surprise was the chamfron, a metal horse head armour, worn by the second horse. While archaic items would not have been particularly unusual, we could find no corroboration for metal armour like this in use by 1916. Equally we could not identify or confirm the strange bands round the upper neck of the first horse in the fifth row. All the poses are of animals moving at some speed, which means it is a charge or nothing, though that is understandable if limiting. The poses of the men are much better, and again the charge seems to be the theme here. There are some men firing from the saddle, which in this case is reasonable, and many waving either a rifle or sword in the air. We particularly liked the man with jezail held high in the third row. The man with the massive Mauser pistol is simply pointing it at the head of his nearest neighbour, which makes a pretty useless pose for a charge, and since he is not looking in the direction he is pointing it he looks to be more of a danger to his comrades than any enemy. The very first figure has his sword wrist turned in an impossible direction, and is anyway looking like he is about to bring the sword down on his own head, so is very flat. The man with the flag is a worthy inclusion as many flags were carried by such men (of various sizes it would seem), though as so often there must be a fearsome crosswind today as the flag is fully stretched and being blown directly across the man's head, i.e. sideways. As before Strelets have tended to exaggerate the size of smaller items, of which the Mauser is the most apparent. However the sculpting is not too bad in general, with some of the faces being particularly expressive and natural. There are problem areas such as the third figure in the top row, whose rifle is bent round his body, and the fourth pictured horse has something very strange going on round his front right hoof, but generally the sculpting is nice. We found no flash at all on our examples, but some of the figures are quite a reluctant fit in the saddle and need to be firmly forced into place. For a set named as 'Lawrence of Arabia' we have barely mentioned the man himself so far. Debate about his importance in the Arab Revolt have been going on for decades and will doubtless continue forever, but briefly he originally became involved with the Arab Revolt some months after it started, and became a much-respected leader of irregulars, particularly on raids against the Hejaz railway. Larger actions like the remarkable capture of Aqaba helped to increase his fame, though technically this was done under tribal leaders as Lawrence himself never formally commanded more than his immediate bodyguard. However much of his fame was due to his own self-promotion after the War, which was not above exaggerating his achievements. Whether justified or not, in the West Lawrence is better known than the Arab Revolt itself, and the magnificent David Lean film 'Lawrence of Arabia' (1962) has done that reputation no harm. Which brings us to the question of which figure, if any, represents the man himself here. You might be tempted to look at the man with the western uniform, partly because he holds a Colt pistol, which was a favoured Lawrence weapon. However this would be wrong as Lawrence always wore traditional Arab dress when in their presence in the field, both out of respect and because it was far more practical than his khaki uniform (as he himself said, "...The army uniform was abominable when camel-riding or when sitting on the ground"). He carried a SMLE rifle, so any of the figures with this could potentially serve as Lawrence. However we have hinted at another option, which is that he is not here at all. For his long-distance raids against the railway line or other targets, he rode a camel, since a hose could not make such a journey. Though he may have ridden a locally borrowed horse once he faced the enemy, the iconic view is of him on his usual camel, so none of these figures really feel right for Lawrence. So we were not keen on a few of the poses, but really liked some of the others. The costume is fine for man and beast, though some of the horse poses disappointed too. Decent Strelets sculpting, though with a couple of less appealing Strelets features. The mention of camels brings us to our last point, which is that camels were by far the most useful animal for most of Lawrence’s actions. While horse-mounted Arab fighters are perfectly fine, a typical Lawrence raid would mean riding camels long range into the desert, dismounting to destroy a railway line or attack a train, and then remounting to return home. The figures in this set work well for actions like the final attack on Aqaba, but to depict the typical Lawrence raid we would hope for a similar set with camels at some point in the future. Until then, this is a decent set despite its faults and an appropriate release for the hundredth anniversary of the start of the Revolt.